These systems are equipped with extremely powerful magnetic drums which makes them a perfect solution for separating very small iron particles as well as stainless steel. The magnetic part can be rotated to adapt the machine for your specific material. The drums are available in diameters of Ø300mm and Ø400mm with a standard stainless steel or optional manganese shell if processing abrasive materials. 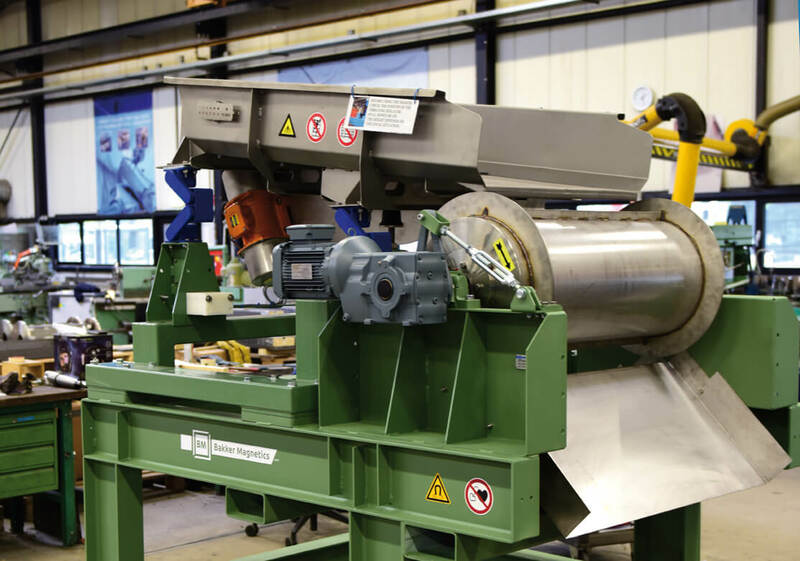 High Intensity Separator Systems can be fitted with a Ø300mm or Ø400mm High Intensity drum and include an SEW engine, vibrating feeder, material splitter and the framework on which everything is mounted. Easily installed into the production line or used as a stand-alone system. Apart from our standard range of widths we can adapt them to your specific need if necessary. • Manganese steel shell to protect the drum from impact and abrasive materials. • Manganese wear plate in the vibrating trough to protect the feeder from impact and abrasive materials. The magnetic part of the drum is adjustable for optimal adjustment on your situation.